You have to understand that the devil will actually use pressure to try to cause you to make the wrong decisions in life. Never make a decision under pressure. Sometimes, you might need to go “sleep in the back of the boat” in the middle of the storm. The Bible says to be led by peace, not pressure! If the enemy knows you can be controlled by pressure, he will know exactly where to attack you every time. Don’t give place to the enemy! One of the ingredients to the Anointing Oil in the Old Testament was Olive Oil. To get olive oil, the olive must be crushed. Therefore, that ingredient in the Anointing Oil represents crushing, squeezing and pressing in the life of a person who wants to be used by God. When pressure (crushing) is placed upon you, whatever is in your heart is going to come to the surface. What comes from you will either be patience, peace, joy, and all the fruit of the Spirit – or it will be strife, bitterness, envy and the works of the flesh! You will never know what’s on the inside of you until you are put in a place of pressure and it’s forced to come out. When all hell is coming against you, all of heaven should be flowing out of you! You can’t ‘pretend’ to be Anointed when pressure comes – it is evident by how you handle the situation what you have been filling yourself with! When people start complaining about pressure, they are looking at their own abilities and limitations. God wants us to not look at ourselves, but look unto Him. It’s not by might, nor by power, but by the Holy Spirit. Stop limiting yourself by what you can do, and start realizing that with God in your life NOTHING is impossible! He is the way maker! He is the water walker! He is the dead raiser! Blind eye opener El Shaddai, He’s the God of more than enough! It’s vital that you look to the Word in times of pressure. 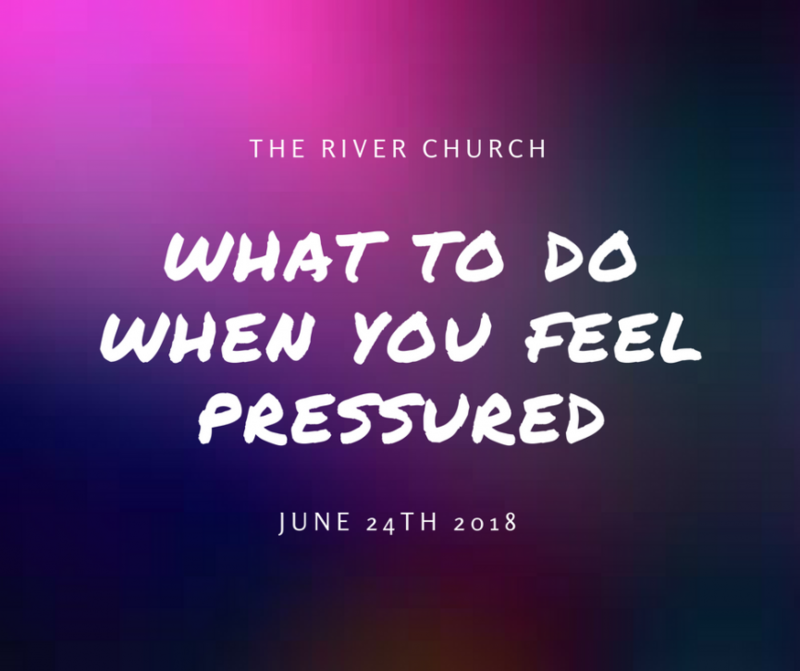 Whether financial pressure, work related pressure or even serving at the Church. There is a solution for every problem man faces in the Word! Find scripture pertaining to what you’re dealing with, and stand upon it! As a preacher, sometimes I haven’t even known what I was to preach until I got behind a pulpit in front of everyone. You want to talk about PRESSURE? This one time happened to me when I was to preach on Television. But man, when I got behind that pulpit, it was probably the best message I had ever preached! I remember listening to myself thinking, “Wow! This is not me preaching right now! This is all God! !” The Holy Spirit wants us to TRUST Him, and not rely on our own ability! That doesn’t mean we don’t prepare. We should prepare like it all depends on us, but when we give out, we should do so as if it all depends upon Him! And rely TOTALLY and completely on Him!